If you've enjoyed all of the great products from Sinister Labs, you are absolutely going to love the new protein packed, soft baked cookie! The SinFit cookie is not only the best tasting protein cookie on the market but it is also gluten free, trans fat free and contains no hydrogenated oils. 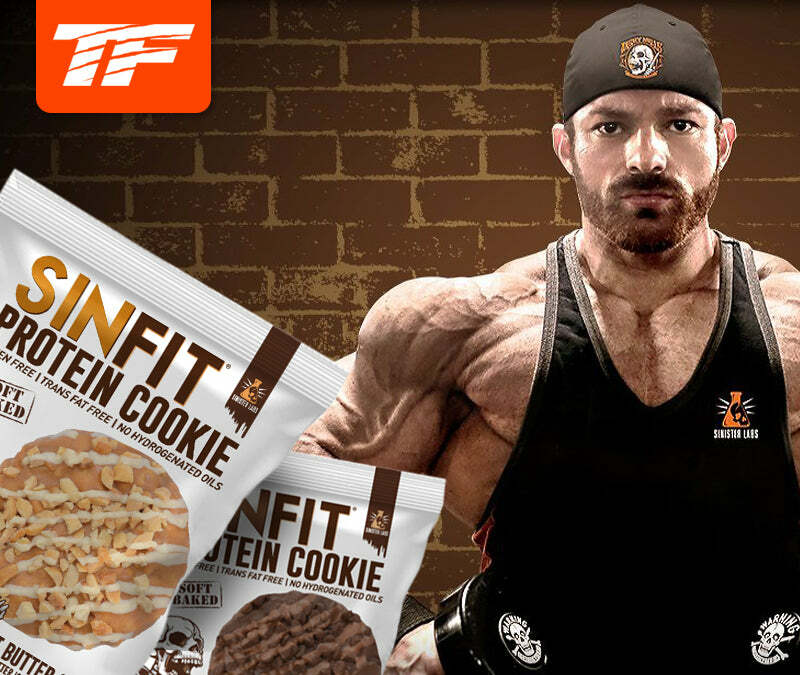 Whether you're competing for a show or just need a high quality protein based snack in your diet, the SinFit Cookie is perfect for any individual. There are so many protein snacks out on the market today but why not look for a product and brand you know and trust? Sinister Labs SinFit Cookies are a must have and are very well deserving of the hype it gets based on how good they truly are. Pick up a box today and experience the great tasting cookies! INGREDIENTS:Protein Blend (Whey Protein Concentrate, Whey Protein Isolate), Brown Rice Flour, Vegetable Glycerin, Vegetable Oils (Palm, Palm Kernel, Soybean), Maltitol, Sugar, Soy Protein Isolate, Cocoa (processed with alkali), Water, Chicory Root Fiber, Corn Syrup, Corn Cereal, Baking Soda, natural Flavors, Sunflower Lecithin, Potassium Sorbate, Whey, Mono and Diglycerides, Soy Lecithin, Beta-Carotene, Vitamin A Palmitate, Sorbitan Tristearate, Almond, Peanut and Sucralose. INGREDIENTS:Protein Blend (Whey Protein Concentrate, Whey Protein Isolate), Brown Rice Flour, Vegetable Glycerin, Vegetable Oils (Palm, Palm Kernel, Soybean), Maltitol, Sugar, Soy Protein Isolate, Cocoa (processed with alkali), Water, Chicory Root Fiber, Chocolate Liquor, Cocoa Butter, Baking Soda, natural Flavors, Sunflower Lecithin, Potassium Sorbate, Whey, Mono and Diglycerides, Soy Lecithin, Beta-Carotene, Vitamin A Palmitate, Sorbitan Tristearate, Almond, Peanut and Sucralose. INGREDIENTS:Protein Blend (Whey Protein Concentrate, Whey Protein Isolate), Brown Rice Flour, Vegetable Glycerin, Vegetable Oils (Palm, Palm Kernel, Soybean), Peanuts, Maltitol, Sugar, Soy Protein Isolate, Cocoa (processed with alkali), Water, Chicory Root Fiber, Baking Soda, natural Flavors, Sunflower Lecithin, Potassium Sorbate, Whey, Mono and Diglycerides, Soy Lecithin, Beta-Carotene, Vitamin A Palmitate, Sorbitan Tristearate, Almond, Peanut and Sucralose.